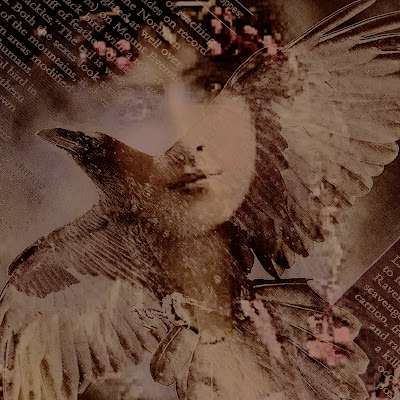 I am very pleased to be a guest host for the Mixed Media Monday challenge this week and my entry for the (Enchanted) theme is a journal page that I made entitled 'Legend'. 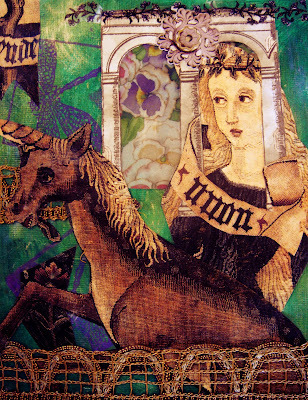 It is hand painted , rubberstamped and collaged with images (Lady and the Unicorn- wikimedia) over- layed with fabric trim, stickers and dried flowers. All kinds of stuff! 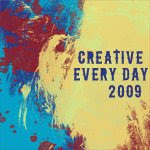 I do enjoy this challenge site as it embodies so many types of mixed media and artists with such versatile styles. I wanted to play with some soft, subtle lighting here (champagne bisque and old rose). I used a photo of a vintage frame that I own and a beautiful Luna Girl image. I added the birds as if they are looking in at their feathered friend. Artistive filters added in Photoshop. This is my entry for the Sunday Postcard Art challenge (Mermaids). 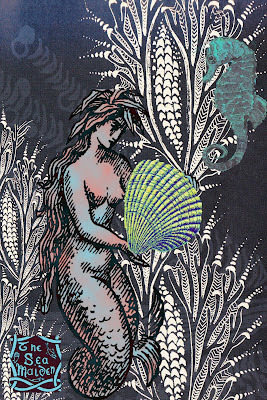 The background is from Dover's (Ornamental Forms in Nature series) overlayed with a vintage woodblock image of a mermaid. The shell, seahorse and logo were painted and added digitally. Gradient filters were added in Photoshop. This is my entry for the 4x4Friday challenge where the theme is Mantra. 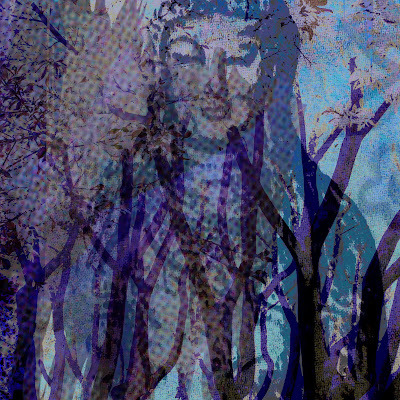 This digital collage represents my own personal mantra of "stay grounded"; being firmly rooted and yet able to branch out and sway with the inevitable storms that life hits you with. The background of this piece is from a personal photo I took in the city of some very dense and enchanting trees (themselves rooted around concrete yet reaching higher and around power poles)! The image is from Dover. Artistic gradient filters added in Photoshop. This is my entry for the Three Muses Challenge this week where the theme is Architecture. I have always found that space as defined by architecture is profoundly influential in my mood and 'comfort' in my surroundings. And that goes for good or bad design! We have all walked into buildings that we just have to get out of and others that we could stay all day. 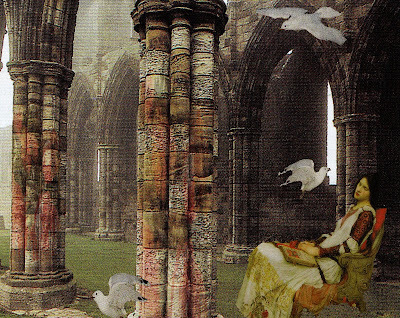 My digital collage shows a woman finding peace and quiet amongst the ruins of an old abbey - still sacred space defined by its character and ambiance. This is my entry for the Collage Obsession Challenge this week. 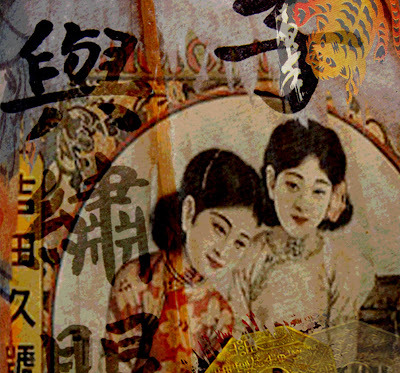 We were given a lovely image of these Chinese girls and I overlayed part of the image on top of a photo of a parasol that I took. I added Chinese coins, lettering and a Chinese new year (Tiger) stamp from my collection. Artistic brushed used in Photoshop. This is my handmade entry for the Gothic Arches Challenge this week where the theme is Steampunk. 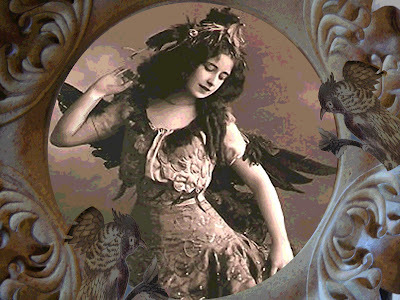 I used an antique Alchemical image (Dover) for the background and overlayed it with opaque vintage clock images. Face image is from (Stampington). I added hand cut metal hardware and trim. I overlayed the scanned arch on to copper paper and added some lead work from one of my stained glass windows in Photoshop for added detail. After a long day at work it was great to venture into the ethereal world for a little while and create my entry for the 4x4Friday challenge (Crow Lady). I envision the crow as a spirit guide or totem to other worlds of illusion and the unknown. The lore of the crow teaches us to speak our truth, know our life's mission and balance past, present and future in the now. Had some fun last night playing with Photoshop brushes- still have a long way to go but here is a first try. 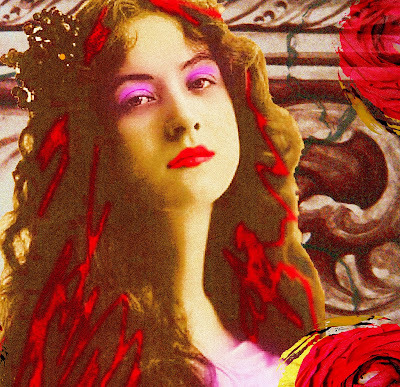 I gave my ( Luna Girl) image a makeover. The background is built from an architectural detail photo of mine. 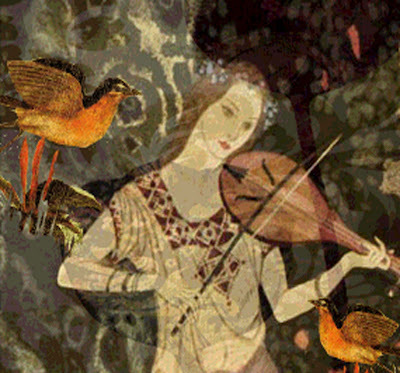 This is my digital entry for The Three Muses challenge this week where the theme is (Nature). I based this piece on a beautiful marsh area (Rush Creek) where I regularly take hikes with my dog . The background is made from a photo of some old burl lumber from my yard and the moon is a photo I took early one morning. 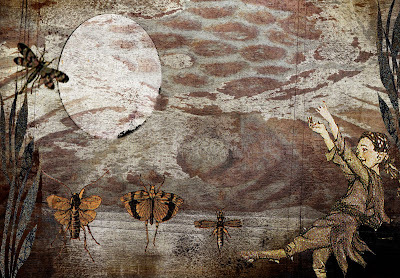 The moths are rising with the moon (phototactic beings that they are) and I added the pixie (Dover) for a little enchantment. Rush and reeds are digitally made. Artistic brushes were used for coloring where the lighting on the 'water' (which is basically wood grain from the burl photo) happened magically with added gradient mixtures in Photoshop. This is my entry for the Collage Obsession challenge where this beautiful image was provided along with the prompt "Misty". I saw in this photo a proud native man who in the early morning mist remembers the"old ways" of the medicine wheel of his people. 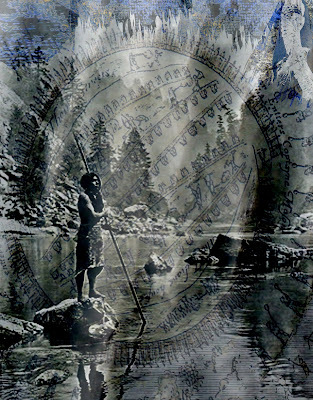 I used a vintage Native American shield cover with symbols and figures as the background, added the image of the Hawk (from my journal pages) and a personal photo (waterfall) to create the mists. Added artistic brushes in Photoshop. 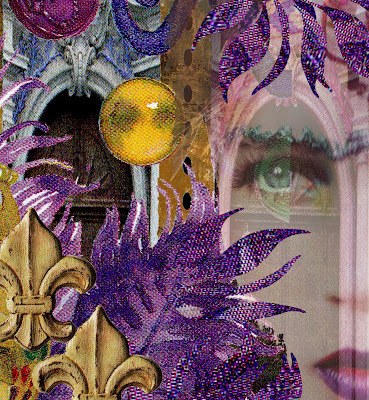 This is my entry for the Mixed Media Monday Challenge (Mardi Gras). 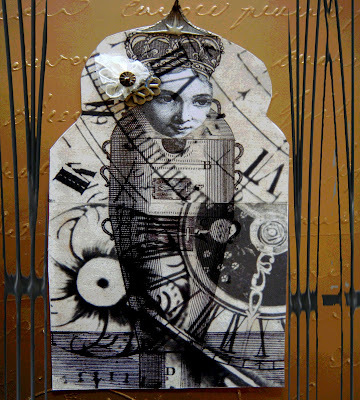 My digital collage is made from artist stamps (Art Chix), fashion magazine clipping, polymer clay fleur de lis, and feather patterened fabric digitally cropped and layered. The celebration is about to begin! 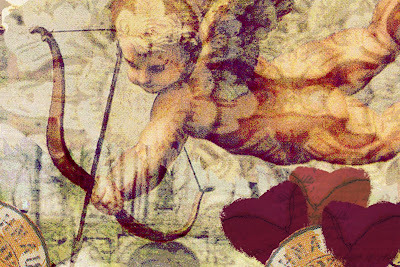 This is my Valentines entry for the Sunday Postcard Art challenge (Cupid). I'm not a huge romantic but I went with a classic design here with multi layers of background and artistic brushes. Cupid image is from (Dover) , hearts (Christine Adolph) and stamps (scrappy chic). I wanted to create an old Italian Renaissance feel to this postcard . Happy Valentines Day! This is my entry for the 4x4Friday Challenge (Spirit). 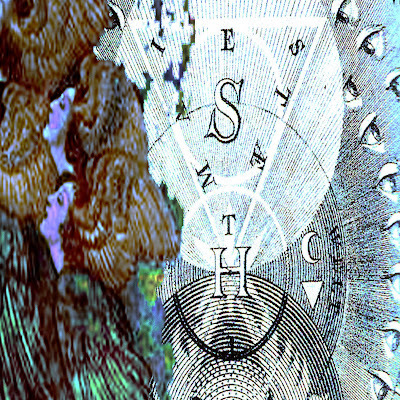 This is a digital collage incorporating antique celestial maps, rubber stamping , Dover images and artistic brushes in Photoshop. I am a firm believer that spirit is the higher form of ourselves- it is what keeps us elevated; always rising and uplifting. It is the essence of a person that we need to look for and embrace if we can. 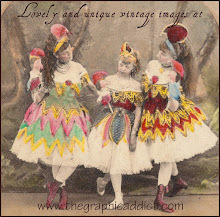 This is my entry for The Three Muses Challenge this week (Postal Art). The card is digital ( which I printed out onto cardstock) and I decided to make my own envelope in the botanical theme by hand. 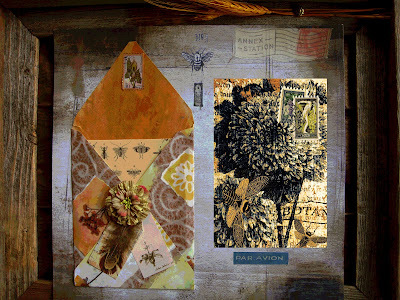 The envelope I traced and cut out from artist papers (Stampington) folded, glued and hand painted the inside. I added handmade tags, stamps and mixed ephemera for fun! 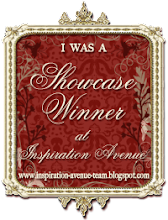 Today marks the one year anniversary of my blog! What a year this has been... I have met so many wonderful artists around the world and have learned so much from everyone. All of the wonderful challenge sites have kept me busy and in love with collage and I hope to be able to keep up (there are so many each day)! Many thanks to all who have left their generous comments- you keep me going and striving to be better. You are all truly inspirational with your beautiful art. This is my entry for the Collage Obsession Challenge - (Longing). When I saw this beautiful image that was offered on this challenge I saw a face that was full of emotion- definately longing mixed with a bit of fear and anxiety. 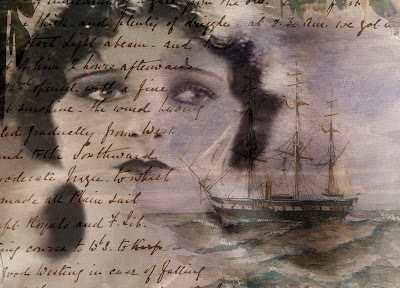 I pictured a Sea Captain's wife at home longing for the return of her husband after many months or perhaps years at sea receiving only letters of his whereabouts and condition. 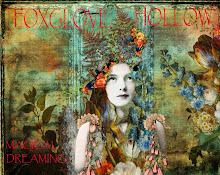 This is my entry for the Mixed Media Monday challenge (Romance). 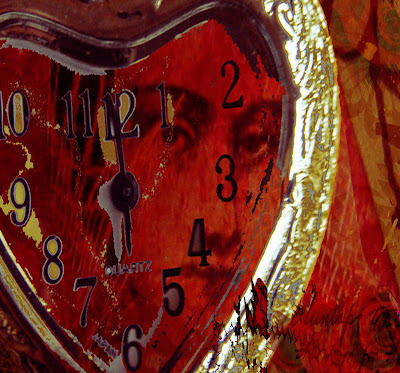 Hearts , roses, the passage of time and a little sense of mystery help keep romance alive. Personal photos, locket, artist papers-Stampington. Well I couldn't help myself this morning when I saw the theme for 4x4 Friday (King Raven) and had to create. 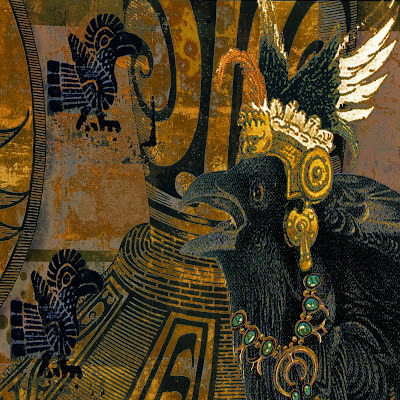 My Raven has a Mayan influence adorned with crown and necklace (Ravens love shiny things) along with pre-Columbian symbols and art. 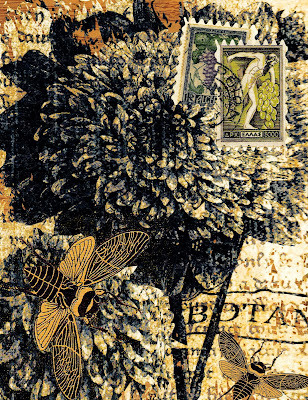 The background is from a journal page I made (rubber stamping, antique art images) Raven and crown (Dover images) and necklace (from a postal stamp). Ravens are a powerful symbol for me . Their lore depicts them as seekers of knowledge ( they are highly intelligent) healing and initiation, and the gift of prophecy. 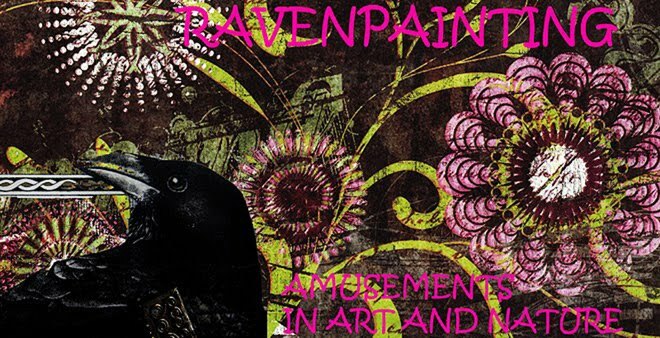 They love to collect and cache things they have found to create their nests and in fact, that's where the idea for "Ravenpainting " came from. This was a fun challenge! I have been working on some mixed media pieces (this is made from a handmade paperdoll that I made - along with flower elements, stickers and some digitally cut flowers as well). I scanned all images and combined in Photoshop. This is an entry for this week's ThemeThursday where the theme is "Pink and Black". This is my entry for The Three Muses challenge this week where the theme is "Birds Of A Feather". 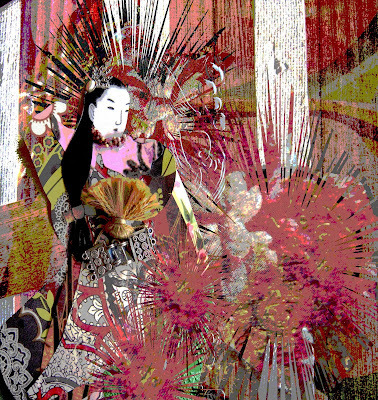 This is a multi-layer digital collage made from (Luna Girl) image, artist papers (graphic 45 and Botanicabella); all images scanned, cropped, layered , and colored in Photoshop. Opacity levels adjusted to allow the layers to unfold, creating a forest/garden like setting .